We are organizing game nights and tournaments around the United States. If you are interested in being a part of a Bin"Fa Games night or tournament in your area, then click SIGN UP. Please include your name and email address in the form provided. As we build a list of players we will begin to organize tournaments and game nights. Sign up for updates. For more information, send us a note by e-mail at info@bin-fa.com or call 877-826-3782. Click here to sign up for updates on tournaments! Go to Overview for an explanation of how the game works. Copyright 2009-2015 Allsaid & Dunn, LLC. All Rights Reserved. 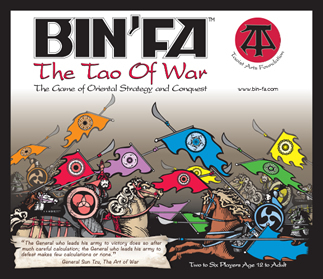 All profits of Bin’Fa go to promote Taoism.